I think it's time we had a heart to heart on what we put on the business end of our line when we fish. There's a lot of thought that can go into our decision on what we should tie on first when we stand at the river with ten boxes stuffed with flies to choose from. Just what do our beloved smallies eat anyway? Victims include (but not limited to) crayfish, sculpin, madtoms, minnows, shiners, suckers, sunfish, leeches, frogs, mice, mayflies, caddis, damselflies, dragonflies and terrestrials of all sorts. Hell, I've seen them eat cork indicators and fluorescent tips of fly lines. To say it simply, smallies are opportunistic feeders. Rarely do they key in on just one food source and totally neglect all others. When you're big dog on the block, you don't stay full being picky. During a bug hatch or at peak crayfish season or other times when one food source is more readily available then others, they may be looking for that one particular food source, but usually won't pass up an easy target of another kind if it came their way. With so many potential food sources to choose from, which one do you imitate first? I can hear you now, "What season is it? What baitfish are available now? Is it mud or rock bottom where we're fishing?" Yeah, yeah, good questions, but it doesn't matter. What I'm going to say now will simplify your fly selection greatly. Imitate all of them and none of them at the same time. No I didn't recently find Zen or loose my sanity. This is the simple answer and it bears repeating. Imitate all of them and none of them at the same time. What is the single most effective lure ever invented? The simple jig. And just what does it imitate? Well, anything you want it to depending on how you fish it. That is the key, how you fish it. Choose a fly that has characteristics of several bait species but doesn't really look like any one. Hinge your bet by covering multiple bases at one time. Look at what is the most effective lure in a spincasters box, soft plastic baits. There are some really hokey ones out there and they don't imitate anything at all, just whatever you want them to be. What you are trying to imitate is life, some living, breathing food source. You need a fly that has motion in it to come alive all on its own. Flies with marabou, soft hackles, rabbit fur or stripes, arctic fox and God bless rubber legs. These are the obvious culprits in bringing a fly to life. I know I upset my trout fishing friends every time I say this but you can't deny the truth. The best flies imitate nothing in particular. I'm not trying to sell the fish my imitation of an olive, emerging, crippled winged, trailing shucked whatever. I'm selling I'm alive and vulnerable. Let the fish decide what they want it to be. I don't care if she thinks it's a crayfish or a sculpin or a leech, just that it's good to eat. Fish are not rocket scientists but they are observant. Sometimes the harder you try to exactly imitate a specific bait; the more glaring the flaws stand out. Where as a bait that imitates all and none could be whatever she thinks it is, but maybe it's one of those other things or even possibly something else. Whatever it is alive and getting away, get it! That other thing over there really looks like a minnow but not exactly. Something is different, I know it's a minnow but I have doubts. I'll pass. I've heard it said about eyewitnesses to crimes or accidents: you see what you want to believe, not what is always true. Anyone who fishes with me will tell you that outside of surface flies, just about everything I tie is a jig type bait, weighted forward with dumbbell eyes. That is because by varying the weight, speed of retrieve and direction (upstream vs. downstream) I can make one fly imitate multiple bait species. How do you make a white minnow-"esque" bait a brown crayfish? It's how you fish it. Put it on the bottom and hop it and you're a crayfish. Crawl it upstream along the bottom, you've got a sculpin. Drift it along the bottom and it may be a leech or a nymph. (Sure does to seem to be a lot going on along the bottom, maybe that's a reason to use jig type flies). Swimming mid-column or on top could be a minnow or shiners. Darting quickly away is certainly a sunfish. Want another kick in the pants; forget about color matching to the prey species. This is something the plastic worm fishing guys learned long ago. Use color as a visual for the fish to find your fly, not to camouflage in like the naturals. Why is an albino animal so rare in the wild? Because he has no color pigments and an inability to camouflage itself so it stands out. The fish that ate him didn't say, "Hey, he's the wrong color, better not eat that." Anyone know who Roy G. Biv is? No he's not related to Earnest T. Bass. He's the color spectrum. Red, Orange, Yellow, Green, Blue, Indigo and Violet. That's the order colors disappear into the depths. Red vanishes first while violet remains visible in very low light. 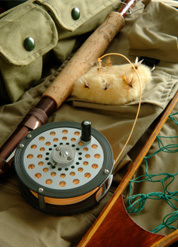 So tie your flies in colors that the fish can see, especially for early morning, late afternoons and stained waters. They can't eat what they can't find. With their lateral lines they use sound to home in a bait but the visual insures a direct strike. Remember, what color you see holding a bait in your hand and what a bass sees in three feet of turbulent water are not the same. Let's tally this up. First you need flies that really don't resemble anything. Use some colors that don't look like anything alive on this planet. Tie them in jig fashion. Then fish them up, down and across stream, top to bottom as you wade along. Vary the retrieve to imitate different creatures to give the bass a full spectrum of bait available till they tell you what they want. This flies in the face of traditional fly-fishing, but then we're bass buggers. And what's a bug? Some big ugly, nondescript creepy crawly thing that fits nicely into the "not limited to" section of the victim's list.